EX stands for extreme and the Buzzaround EX 4-Wheel travel scooter by Golden Technologies certainly lives up to its name. 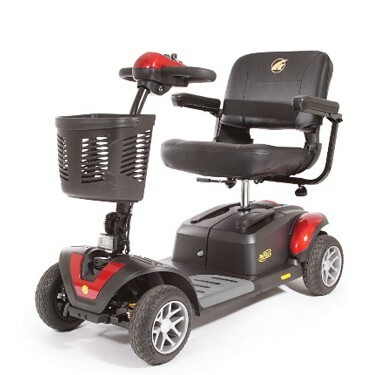 The Buzzaround EX is the fastest model of the Buzzaround family and it definitely goes the extra mile. If you need a heavy-duty yet convenient travel scooter, the EX is the way to go. Seat Dimensions: Width x Depth 20"x 18"
Weight of unit assembled: 155 lbs. Good looking and easy to handle and control. Pros:Very responsive and has good turning capacity. Drivers Weight Capacity: 330 lbs.